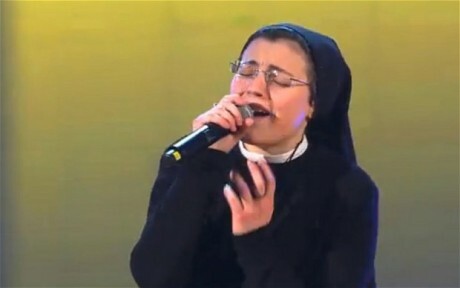 The viewers of The Voice (Italy) were wowed last week with the appearance of Sister Cristina Scuccia who sang “No One” by Alicia Keys. Her amazing performance was met by chants of “So-rella! So-rella!” (Sister, Sister) by the audience which gave her a standing ovation. The video is below. Of course it is a bit visually curious to see a 25-year-old Ursuline nun singing “I just want you close / Where you can stay for ever / You can be sure / That it will only get better”). However, you can translate those words as you wish. Indeed, Sister Cristina says that she hopes that her winning the competition might allow her to meet a real rockstar: Pope Francis. Before she lines up with the rest of the Poparazzi, I suspect that Pope Francis is the type of person not to wait for a decision on the show. How cool would it be to have Sister Cristina as your Sunday school teacher? This nun needs a glam shot. I know one that is a miracle worker! I hate that style of singing more than anything in the entire universe. How about some Bach, sorella, sorella?? It is nice to see that a person doesn’t need to be freaky and be outlandish to be show worthy. A positive view of religion, refreshing. She’s a helluva lot better than those French Singing Nuns w/ Doninique, back in the 60’s. That was torture! Good voice, but can she fly? Sister Cristina is a living example for the youth of today, who need to find and know God in their lives.